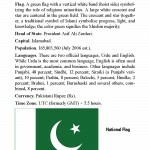 This handbook provides basic reference information on Pakistan, including its geography, history, government, military forces, and communications and transportation networks. This information is intended to familiarize military personnel with local customs and area knowledge to assist them during their assignment to Pakistan. The National ICT R&D Fund invites proposals from academia/research institutions, companies, organizations for the development, deployment and operation of a national level URL Filtering and Blocking System. Institutions/organizations/companies desirous of developing, deploying and managing the proposed system are requested to submit their proposals to the ICT R&D Fund Islamabad by 1500 hrs on 2nd March, 2012 as per the prescribed format. 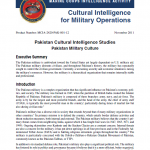 Two reports from the U.S. TRADOC Intelligence Support Activity (TRISA) regarding suicide attacks in Pakistan and Afghanistan going back as far as 2007. Secret Government of India – Indian National Investigation Agency report on the interrogation of David Headley. Based on the current observed levels of participation on social network sites (SNS) in Pakistan and the country’s past experience with street protest movements during the 2007 State of Emergency and 2009 lawyers Long March, it is possible that Internet users could leverage such sites to organize grassroots protest movements, but the intensity of such efforts would likely be limited by several factors. Over the course of July and early August 2010, Pakistan experienced the worst monsoon-related floods in living memory. Heavy rainfall, flash floods and riverine floods have devastated large parts of Pakistan since the arrival of seasonal monsoon rains on 22 July. Assessments of losses and damages are ongoing, but estimates place the number of affected people at more than 14 million. Over 1,200 people have died, and at least 288,000 homes have been damaged or destroyed. In Khyber Pakhtunkhwa (KPK) Province, intense rains during the last week of July and in early August were compounded by the swelling of major rivers due to rainwater surging down from the highland areas. The Pakistan Meteorological Department reports that within one week in late July, KPK received 9,000 millimetres of rainfall – ten times as much as the province normally receives in the course of an entire year. Baluchistan, Pakistan-Administered Kashmir and Gilgit Baltistan, also experienced extreme weather, resulting in widespread losses and damages. Pakistan Prime Minister’s Secretariat Flood Update, August 5, 2010.